In the crisp night air a waterbird called; its shrill, repeating cry echoing from the forested domes of the hills and the rippled sandy cliffs. The dim lighting, in the gracefully decaying room with the empty windows, did nothing to obscure the view down to the mirror waters of Lake Como. The lake was lit in silvery blue, confounding the colours of autumn that set the hills aflame by day. In the silence, the water of the lake could just be heard slapping against the four small boats moored at the shore. Near the opposite shore, a boatman was rowing home, a shadow on the water. The lights of lakeside dwellings glittered and flickered, tiny reminders of the ordinary lives going on elsewhere. At the words, spoken in oddly accented German, a huge figure, a killer, relaxed his thick-fingered hands, let a limp body fall, and stepped back into the shadows of the room to join the other of its kind. Lamp light and the flames of the guttering fire danced on the cold metal of the sword and pistol it wore at its belt. The host, who had called this gathering of the rich and dispossessed, stepped forward to the crumpled form on the floor. He ignored, or was unaware of, the vicious stare that the Russian sought to impale him on. 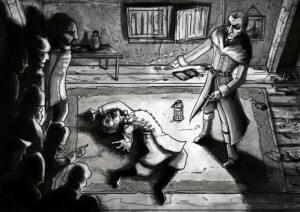 The man quickly checked the Russian’s dead servant, feeling for a pulse on the abused neck. 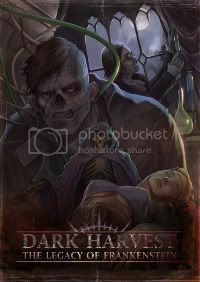 He examined the corpse carefully before standing and moving back into the darkness of the room. The tall Englishman could take no more. He abandoned his faltering German. “That was my servant,” the Russian growled, his low voice somehow cutting through English outrage. The master of the hulking and murderous shadows grunted dismissively. “You were told to come alone,” he said, this time in Russian. Reverting to German, he continued from the darkness. “Still, it did mean that none of you had to die.” The man stepped back into the light, but only just. He was carrying something that glittered in the lamplight. The Russian scowled rebelliously for a moment. Simultaneously, one of the armed men stepped forward, menacingly, and a twig crackled in the dying fire. The Russian and several of his fellow guests jumped. Cursing, the Russian crouched down and, flinching with disgust, checked for signs of life in his former servant. “He is dead.” The Russian straightened, his courage rallying, “What do you intend to do to us?” The young Austrian nodded, looking panicked. The Russian fell back, glancing around at his fellows, seeking some hope in the eyes of the others. Each did the same, most meeting the gaze of their fellow ‘guests’ for the first time that night. Though a common purpose had brought them there, only now did they appear united – by fear. The host held up a large metal syringe. It looked incongruous and threatening held in the long, slender fingers of the man with the sharp, knowing eyes, wearing the long winter coat. How old was he? Thirty? Thirty-five? Who was he, and who were the sullen-eyed murderers who had ghosted from nowhere at his command? “What in the blazes? !” the tall Englishman began. Their host had crouched down by the body of the Russian’s servant. After a moment, he injected half the serum from the syringe into the vein and half into the artery on either side of the neck. He consulted his pocket watch, a remarkably ordinary and functional timepiece. After a short interval, he placed his hands, one atop the other, above the dead man’s heart and began pumping down on the corpse’s chest. The bearded Walachian almost laughed, a strangled and guttural sound, so insane did the actions of their host seem to be. The man glanced up, his eyes fiercely burning with intense purpose. He held the eyes of those he could see, snapping his gaze to each one in turn. Once again, there was silence, save for the grizzly efforts of the man kneeling on the floor. The man stopped. He pulled forth his watch again, glancing at it. He looked closely at the corpse, at its ghastly visage; the bulging eyes and projecting tongue. The host then stood, looking cruelly satisfied, and stepped back. Without saying anything, he pointed to the body. Then, he melted into the encroaching darkness. All eyes were on the dead servant. An eternity passed in a minute, then another. On the floor, the body lay still. The other guests began to shuffle, fearful in their anticipation, utterly unable to comprehend what was happening. Then, the servant’s eyes seemed to change. The tongue slipped back into the gaping mouth. Two of the guests, the Russian and the tall Englishman, took a half step forward. With a shuddering, wailing, gasping cry, the servant’s body arched. His hands clawed the bare wooden floor of the decaying mansion, his nails splitting and cracking as he gouged the boards. His head whipped back and forth, his body wracked with spasms. Suddenly he stopped, utterly limp, his breathing ragged. The Russian who, like every one of the other guests, had tumbled backwards as the servant lurched back to life, now came rushing forward. He was quickly joined by three others, all checking over the rapidly reviving man with the terrible, suggestive bruises flaring on his neck. All the while, as a babble of amazed discussion broke out in small patch of flickering light in the room, the slender fingered man in the shadows watched. Watched and smiled. No one there heard his quiet, triumphant whisper.